I went down to hang out with some of my friends this morning, but they weren't at their usual spot on the shore. I found their cars, so I figured they must be in the water. 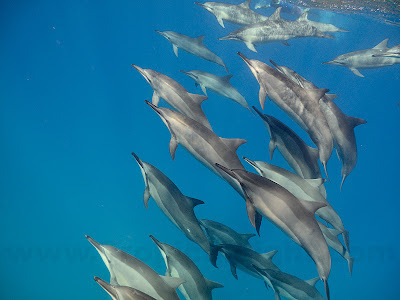 I quickly swam out to them and a few minutes later a group of 32 Spinner Dolphins swarmed up around us. The dolphins were definitely in sleep mode but moving fast. 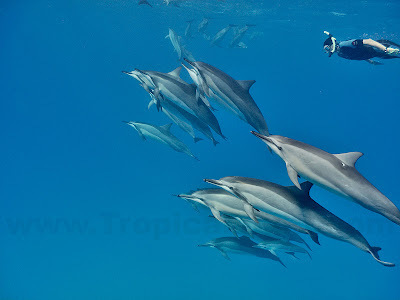 I HATE not getting enough sleep, so me and my friends respect the resting time of the dolphins. 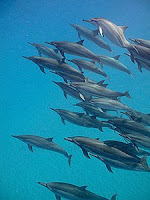 We floated on the surface and watched them pass under us again and again. They would usually surface to breathe nearby, and sometimes they would come up among us to breathe. Who cares if there was no direct one-on-one interaction? It was great just being around them.